Whether you are looking to make good on that New Year's resolution, get those six-pack abs you have always wanted or you just want to be healthier, there is something for you on our list of the best workout apps. You will find apps that provide systematic instruction, just like an expensive trainer for little or no cost. 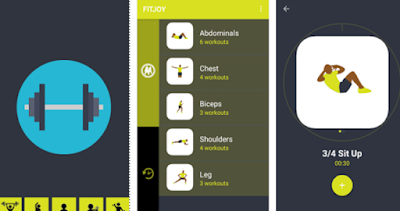 From strength training and yoga to running and more, you will find a great workout partner here in app store, therefore to help you for getting the best one for your smartphone we have selected, FITJOY – Simple Workout App. FITJOY – Simple Workout App is a great starting point for you if you are looking for a solid and simple app to get you motivated and ready to start your fitness routine. It offers variety of different exercises and workout routines for you to try, no matter your fitness level or available gym materials. Each workout follows a proper progression of lifts and exercises to maximize your time spent at the gym, with each step giving you a time or number of sets and reps to complete before you move on. All of the exercises have a moving diagram showing the proper form for the exercise, as well as further information on the moves if you need even more help. This app offers moderate levels of exercises correlated with anti-aging and improving quality of reducing inflammatory strength. By using this app, you can achieve about 3500 metabolic equivalent minutes per week. This app is available for you Android devices and you can install it from the links present at the end of this review.